I could have called it creamy chickpea soup or cream of garbanzo bean, but I didn’t want to scare you off by using a name that sounds like it belongs on a can of condensed soup or as if it relies heavily on cream. No, I’m better off calling it by it’s Italian name- Crema di Ceci. Say it with me- “chay-chee”. Much better, right? 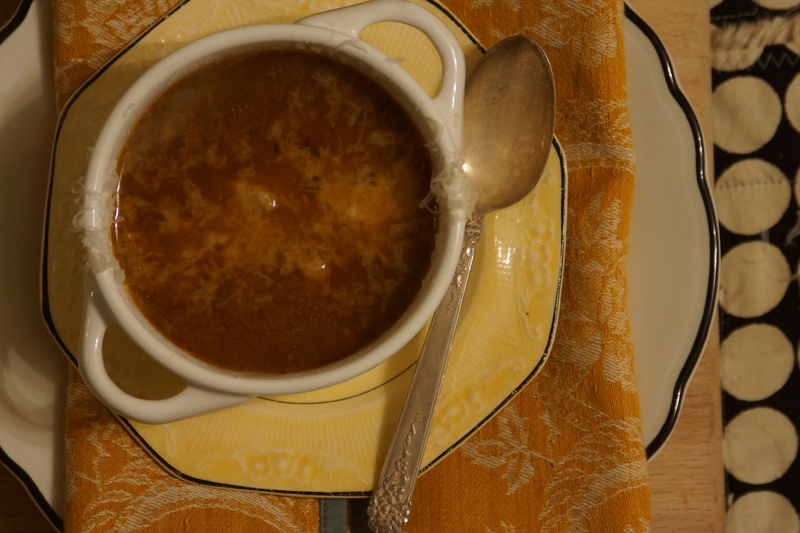 Now this simple soup has a bit of intrigue, sounds a little more exotic, a lot more delicious. Good enough to necessitate opening a bottle of red wine. How many other bean soups can do that? Sometimes it’s all in the branding and I want you to make this, after all. And you have no reason not to! In addition to being downright tasty, this soup is warming, nourishing, and healthy. It’s vegan without even thinking about it, getting all its creaminess from the pureed legumes. 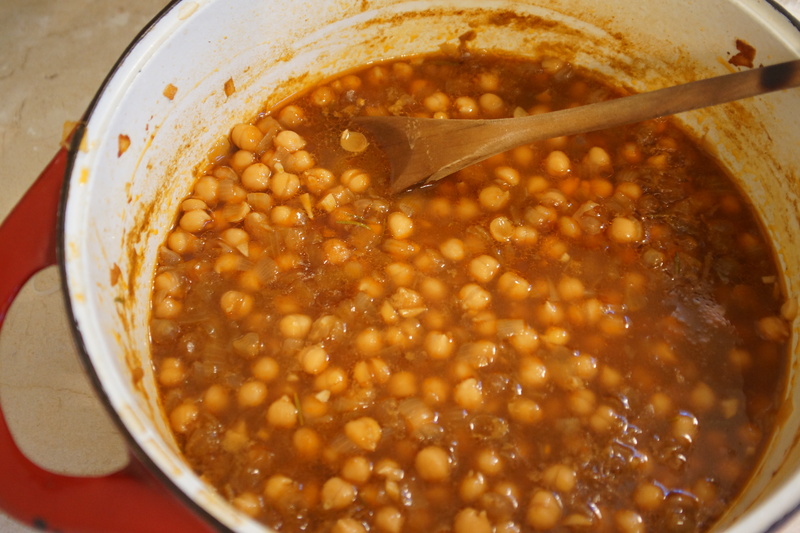 It is easy to make as long as you remember to get your beans soaking the night before (and have some nice vegetable stock on hand) but if you want to cheat and use canned chickpeas, your secret is safe with me. This soup, like most pureed soups, is delicious as is but a little garnish is always welcome to provide a contrast of textures and flavors. 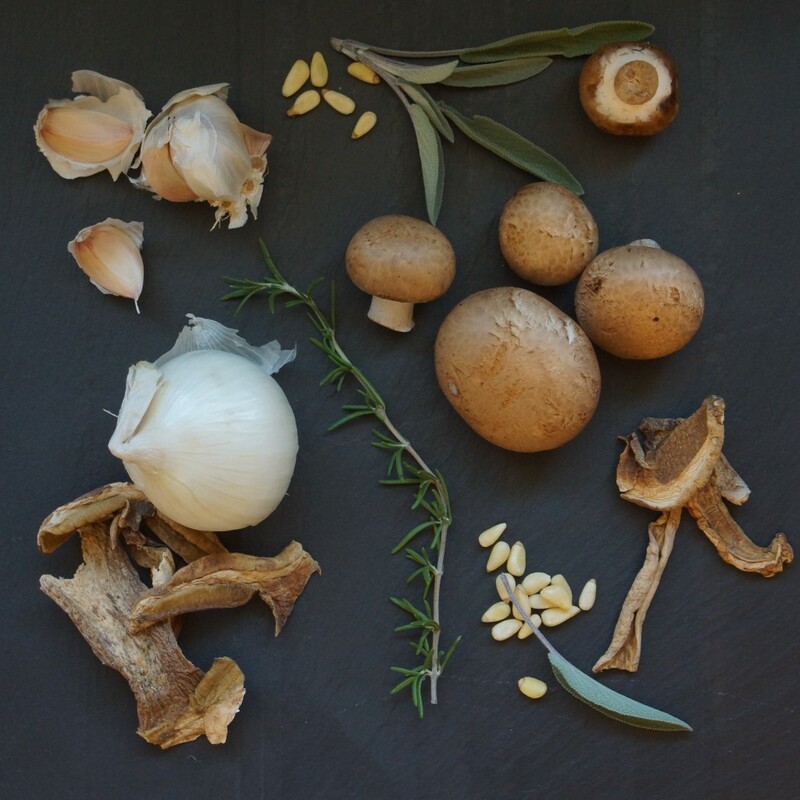 Since today we gave this soup a charmingly Italian name, we’ll go that route on the garnish by adding Porcini and Crimini mushrooms and a sprinkling of pine nuts. Flavor still life…or natura morta, if you prefer. 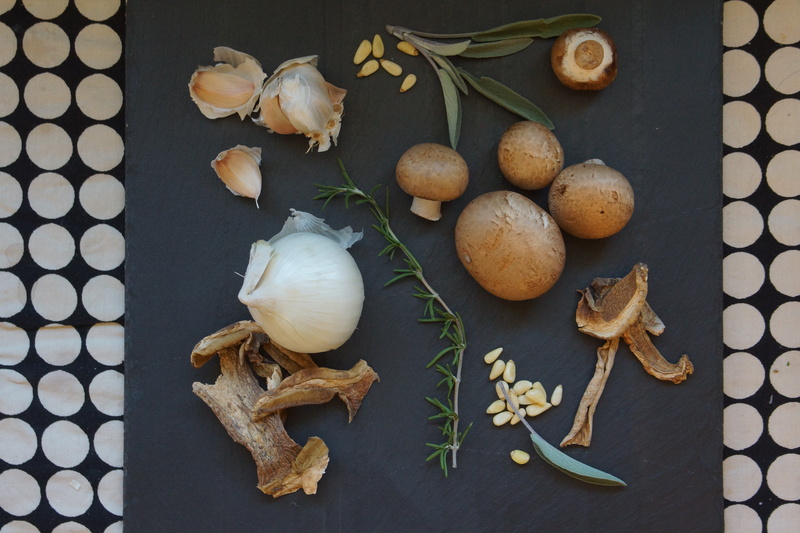 Onions, herbs, mushrooms, garlic, pignoli. 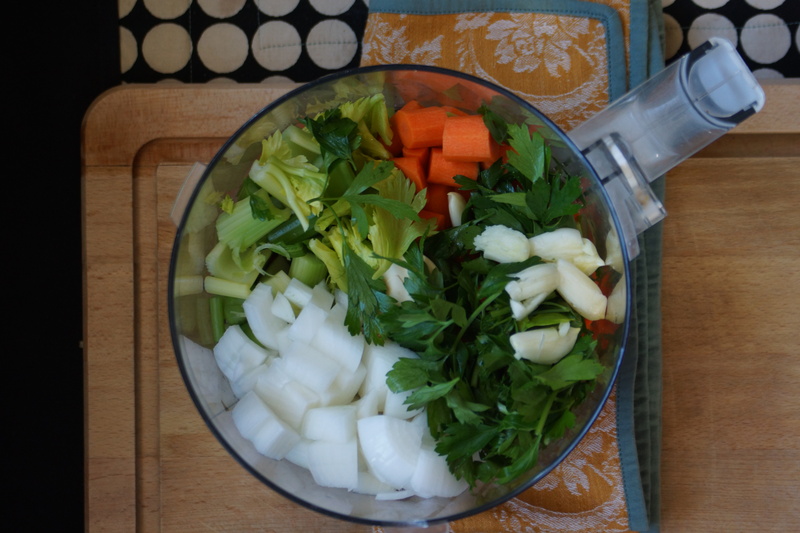 Let’s get this soup underway. Cook your beans. You get an hour of downtime. You could use this time to make vegetable stock or mix up a quick batch of foccacia. Your soup would appreciate either gesture. Like I said, there is nothing difficult about making this soup. We’ll get some onions into the pot, let ’em sweat, let them get a little color. 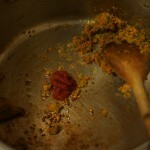 Add garlic, a dab of tomato paste. Toss in your cooked beans, cover with stock. Let it bubble away for an hour. Make yourself a cup of tea and relax; this soup doesn’t need a babysitter. When the beans are super tender and creamy, you are ready to puree. I used my new immersion blender to get the job done but you could toss it in the food processor and buzz ’til smooth. Soup’s ready. Now let’s garnish. I wish I could get my hands on some fresh Porcini mushrooms, but they’re a little hard to come by in these parts and if I were to find them, I’m sure they would be prohibitively expensive. 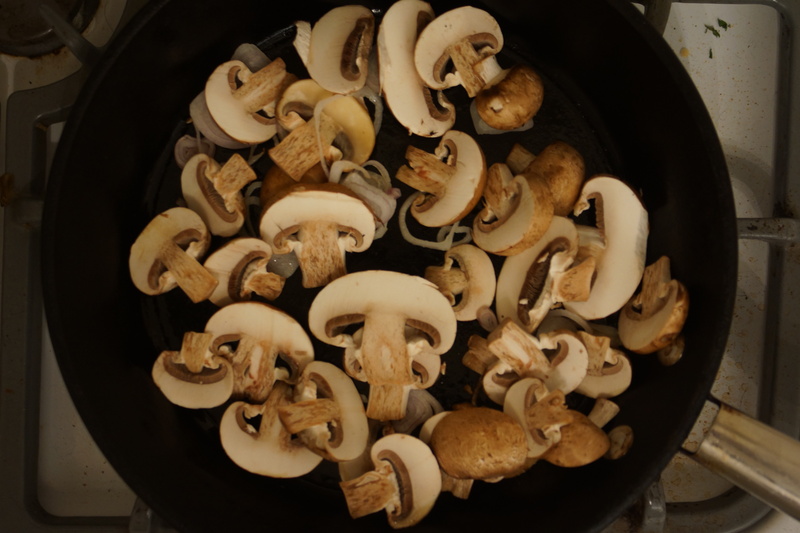 Instead, we’ll soak some dried Porcini in hot water and make them do double time, sautéing them with the Crimini and adding their soaking liquid to the soup to make it even earthier and more aromatic. Sauté sliced Crimini mushrooms and add the soaked Porcini. Let them get in touch with their dark side. Splash in a little Marsala, add a sprinkling of herbs. 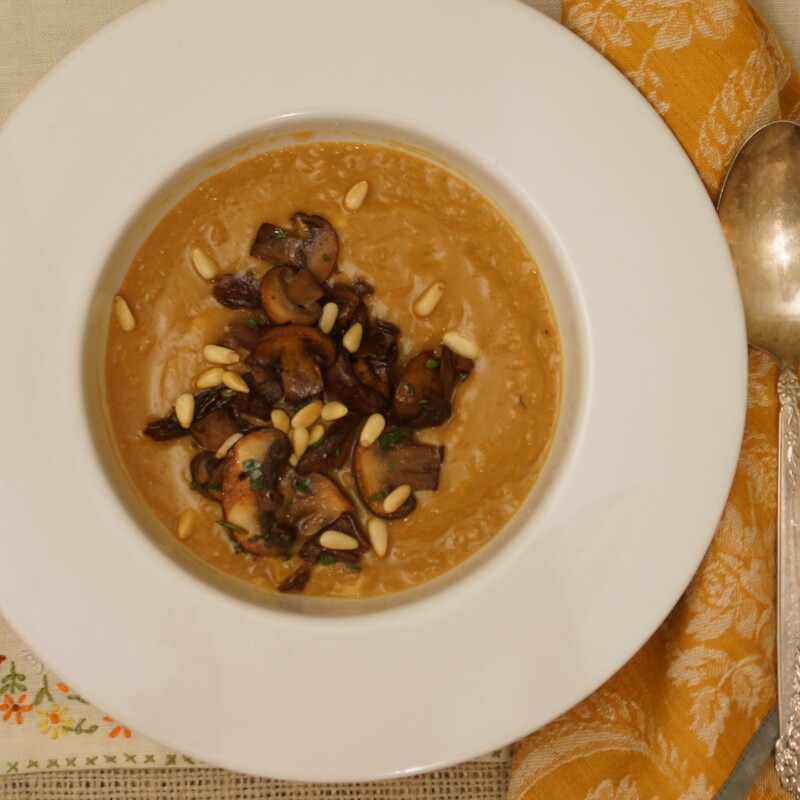 Ladle up your soup, top with mushrooms, toss on pine nuts. Bam. Dinner. Done. Drain and rinse soaked chickpeas. 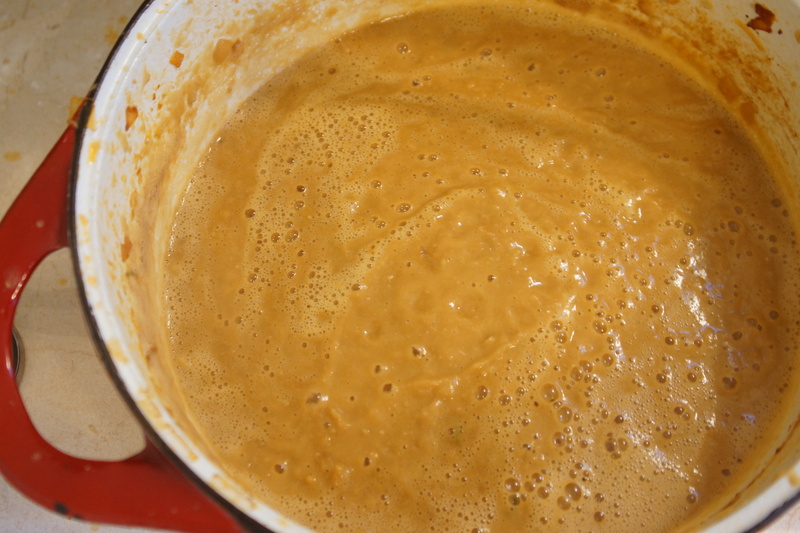 Place in medium saucepan and cover with cold water. Add a halved onion, sage leaves, and bay leaf for additional flavor, if desired. Bring to boil, reduce to simmer. Skim any foam that rises to the top. Cook beans about 1 hour, until tender. 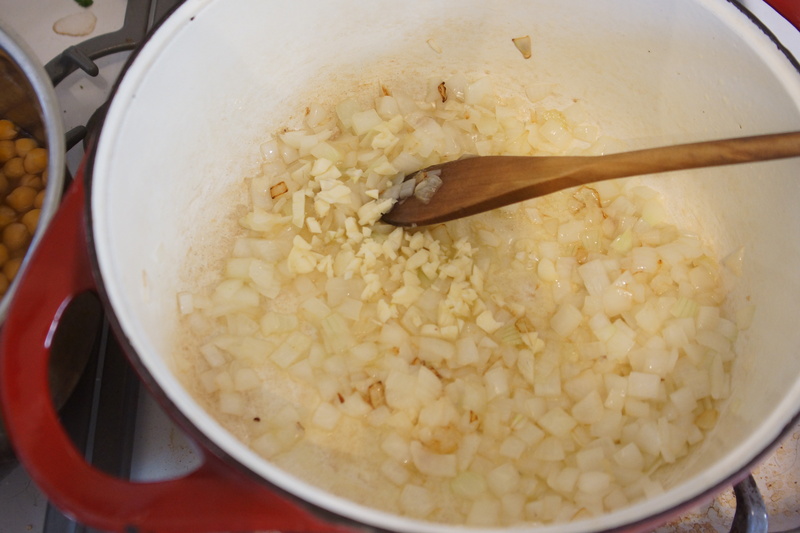 Remove from heat, remove onion, sage and bay leaves, season with salt. Do not drain. In a heavy bottomed pot, warm 3 T. olive oil over medium-high heat. 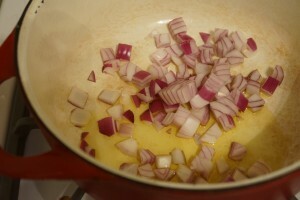 Add onions and saute until golden. 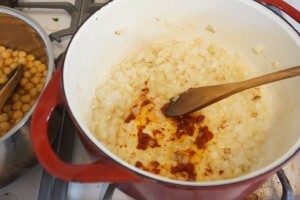 Add 3 cloves minced garlic and tomato paste, stir to coat onions and allow tomato paste to get a little darker. Add beans with cooking liquid and stock. Tuck in a couple sprigs of rosemary and a few sage leaves. Bring to boil, then reduce to simmer. 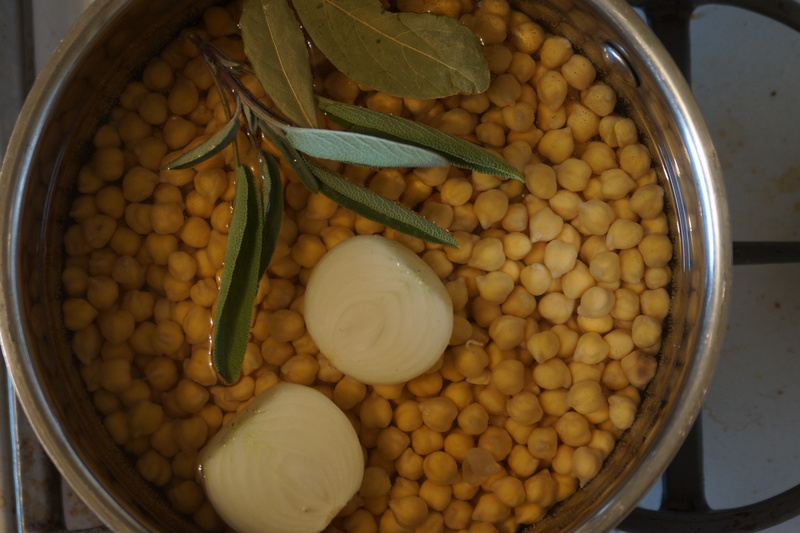 Simmer soup 1 - 1½ hours until chickpeas are very tender and creamy. 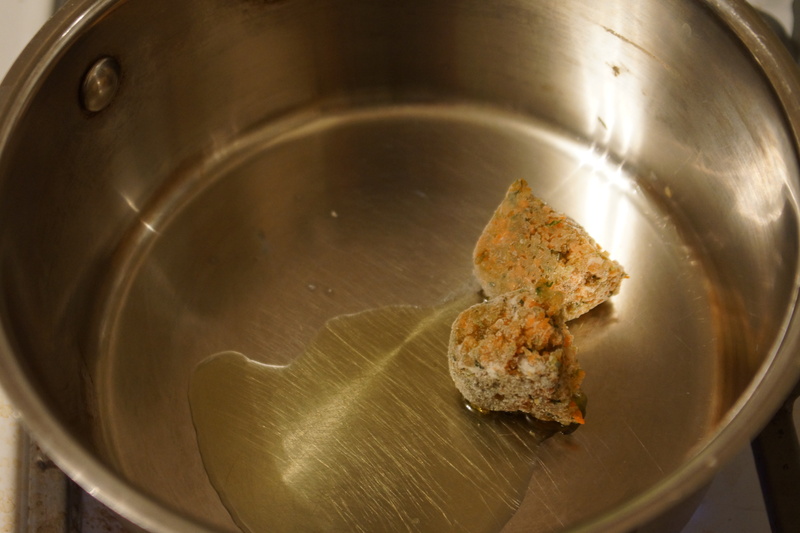 Remove from heat, remove rosemary and sage leaves, and allow to cool slightly before pureeing. Puree soup in pot using an immersion blender or in batches in a food processor or conventional blender. 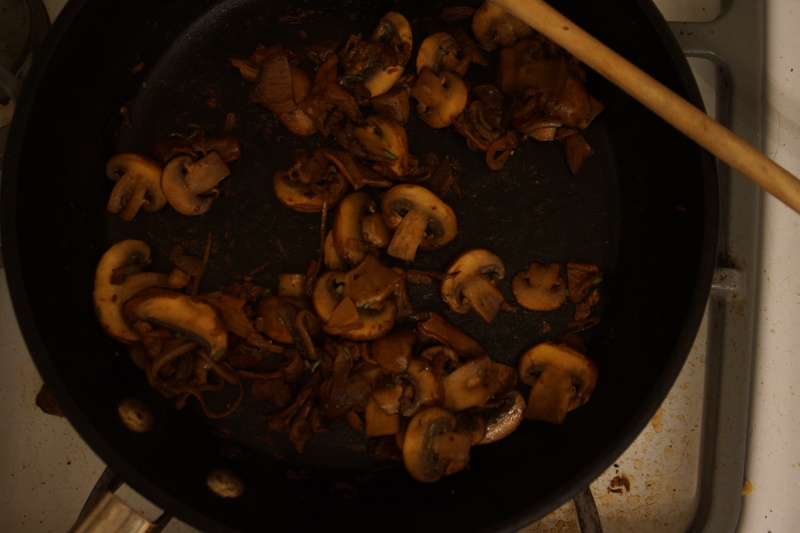 For the mushroom garnish, heat 1 T. olive oil in saute pan over medium-high heat. Add Crimini mushrooms, saute until they have released liquid and are dark brown. Add soaked Porcini mushrooms and garlic, season with salt. Add Marsala, allow mushrooms to absorb. Remove from heat, season with black pepper, some chopped rosemary and parsley. Meanwhile, reheat pureed soup, thinning with Porcini soaking water. Season with salt and pepper and add a squeeze of lemon juice if acidity is needed. Ladle soup into warmed bowls. 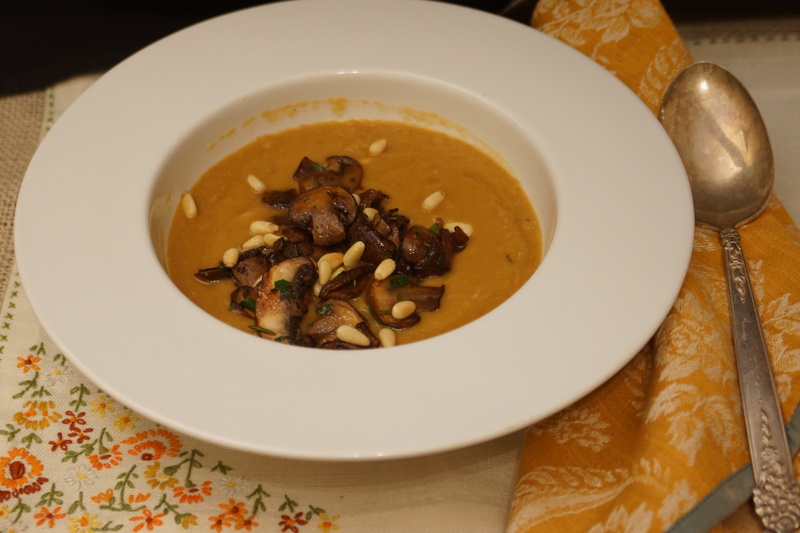 Top with sauteed mushrooms and sprinkle with toasted pine nuts. You can probably guess which of these situations I found myself in recently and I am happy to say the old lady and her cat are very happy to have both survived the blaze. It was nothing, really. I’m sure you would have done the same. Oh, you don’t buy it? Fine, you win, it was the one about the squash and the lamb and it felt pretty extraordinary at the time. It was one of the weeknights where I was cranky and tired and really just wanted to come home and crash, not cook, and definitely not take a zillion food pictures. But that boyfriend of mine happened to be coming home at the same time and just had to stop by the grocery store and discover lamb loin chops were on sale. Matt has the tendency to go to the store, make a bee-line for the meat or fish counter, buy whatever looks good, and count on me to come up with the rest. When I’m in the right mood, it’s fun and I can pretend I’m on Iron Chef, without the pressure. When I’m tired and don’t feel like cooking it feels more like a chore for a taken-for-granted housewife. 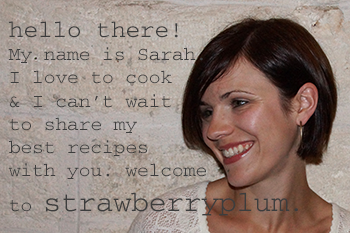 But I have a cooking blog now. I’m not just cooking for myself or Matt, I’m cooking for all of you. It’s my duty and an honor. Plus, there were lamb chops on the line. I had to rise to the occasion. So I stepped out of my cranky-pants, rooted around the fridge, and became the more extraordinary version of myself. What did I find in the refrigerator? 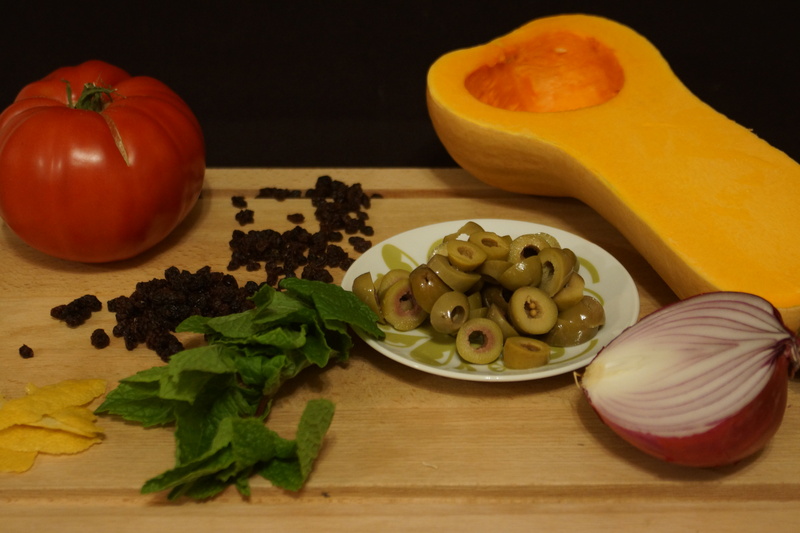 Half a squash, green olives, mint, red onion, a lemon. Let’s grab some currants, cinnamon, and vinegar from the cupboard and see if we can land this dish somewhere between Sicily and Morocco. No time to dilly-dally, we’re on a mission. Let’s chop the onion, get it sizzling, and put it all together. Let it bubble and perk. This is going to taste way more complex than you’d think possible for a thirty minute simmer. 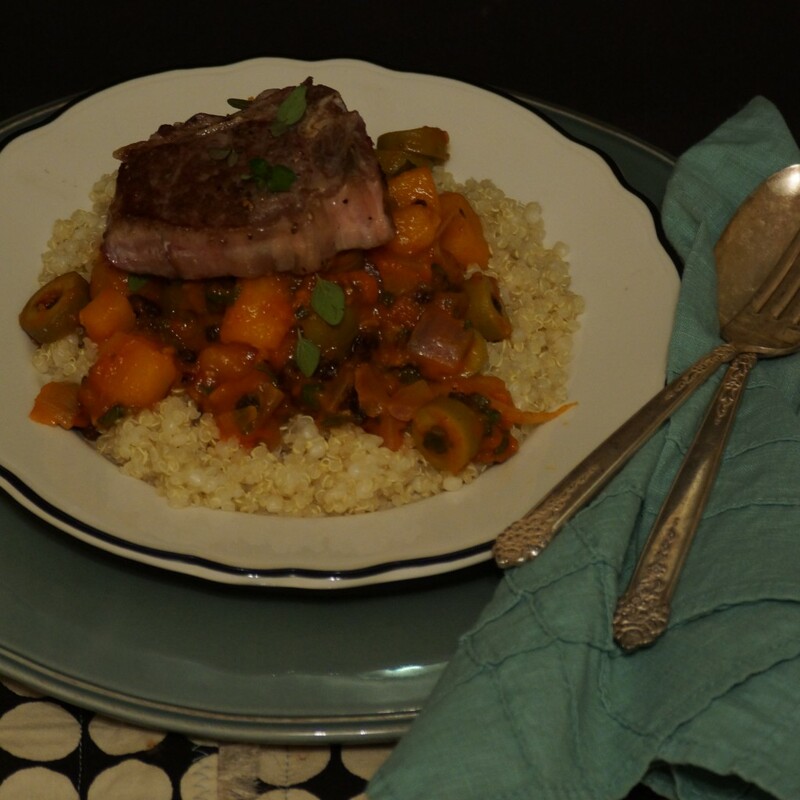 Sear your chops, make some couscous, and you’re there. Dinner! You did it. You’ve uncovered your extraordinary self. You stepped up, impressed yourself, impressed that person you sometimes feed. You’re good under-pressure and this beats moping around in your crabby-pants. This quick squash ragu could easily be served without the lamb as a vegetarian/vegan main course. Heat olive oil in heavy bottomed pot over medium-high heat. Add red onion, fennel seeds, and red pepper flakes, season with salt and saute until the onions take on a little color, 2-3 minutes. 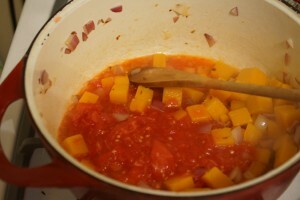 Meanwhile, boil squash until it is slightly tender, about 5 minutes, and drain. This will speed up your dinner significantly. 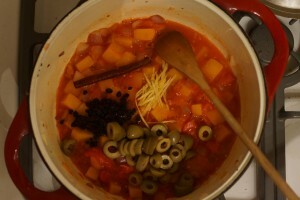 Add crushed tomatoes and squash to onions along with cinnamon stick, lemon peel, currants, olives, honey, and vinegar. Season with salt and bring to a boil. 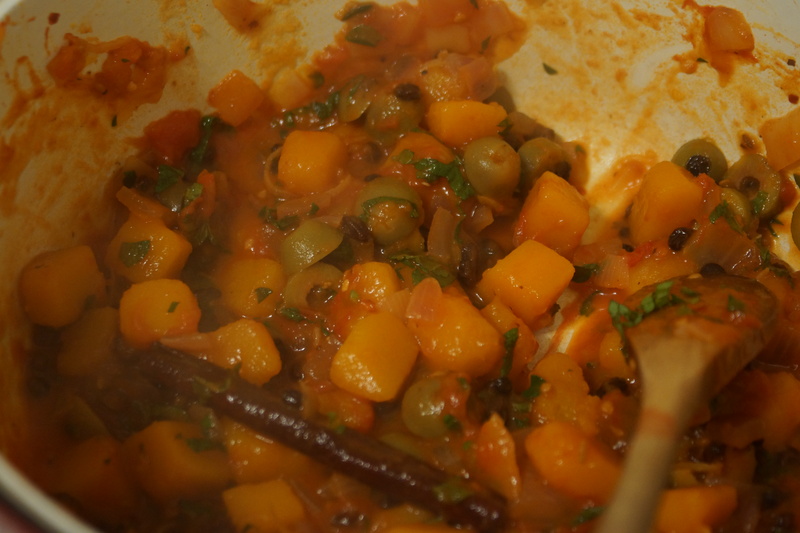 Reduce heat to low and maintain a simmer until the squash is tender, the tomatoes have reduced, and the flavors have married, about 30 minutes, adding water if pan becomes too dry. 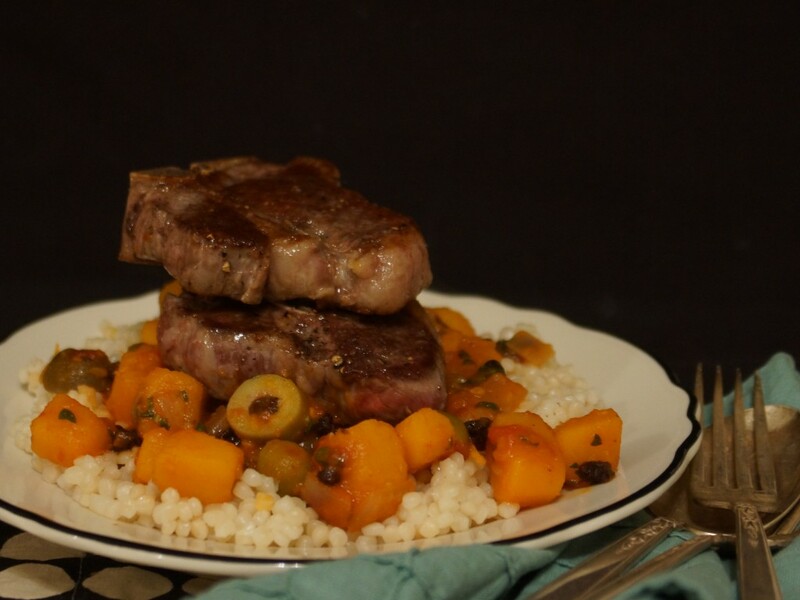 In the final 10 minutes of cooking, prepare couscous and lamb chops. 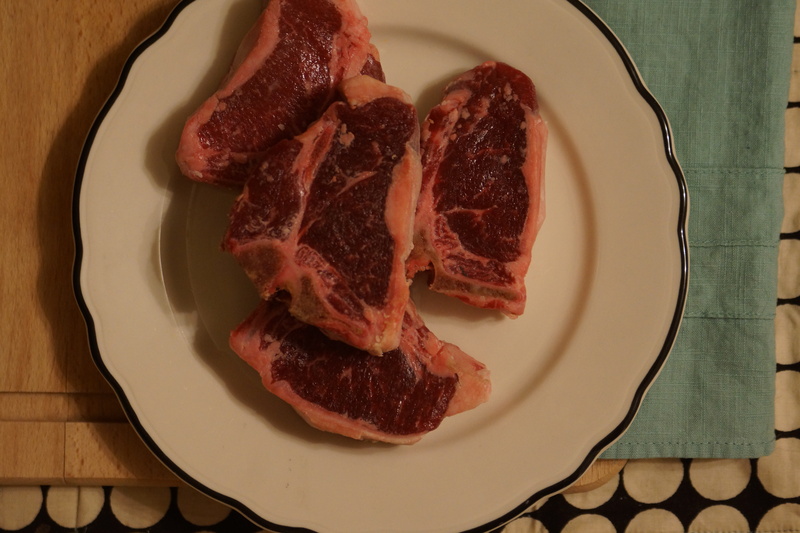 The lamb chops are seasoned with salt & pepper and seared in a lightly oiled pan 2-3 minutes per side. Allow to rest while you finish the ragu. Season ragu as necessary with additional honey, vinegar, red pepper flakes, salt and black pepper. Stir in chopped mint and oregano. Serve ragu over couscous and top with lamb chops. Sprinkle with additional herbs, if desired. You could also braise chunks of lamb in the ragu rather than serving with seared chops. I’m not going to get too preachy with this post because the fact is there are plenty of times when I do not follow my own advice. I’m writing this as a reminder for myself as much as I am writing to share with you. My message today? 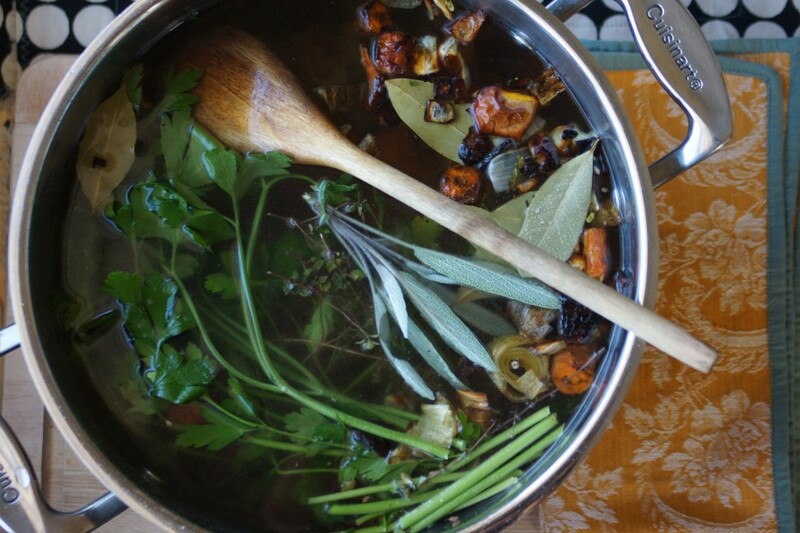 Keep homemade stock on hand. 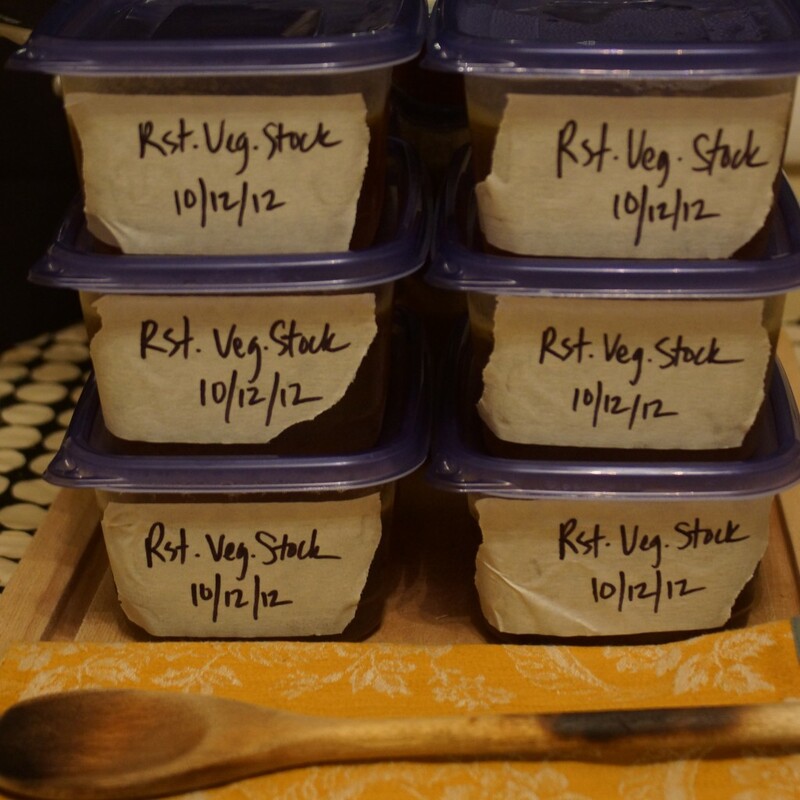 I just made this roasted vegetable stock and it was super easy. I didn’t have to mess with bones or let it simmer for hours and hours and I was still able to walk away with a big batch of stock that is going to improve the flavor of all of my upcoming soups, stew, risottos, Thanksgiving stuffing, braises, and more. I know, right? We want those dishes to be the best they can be. We better get started. Raid your veggie drawer. 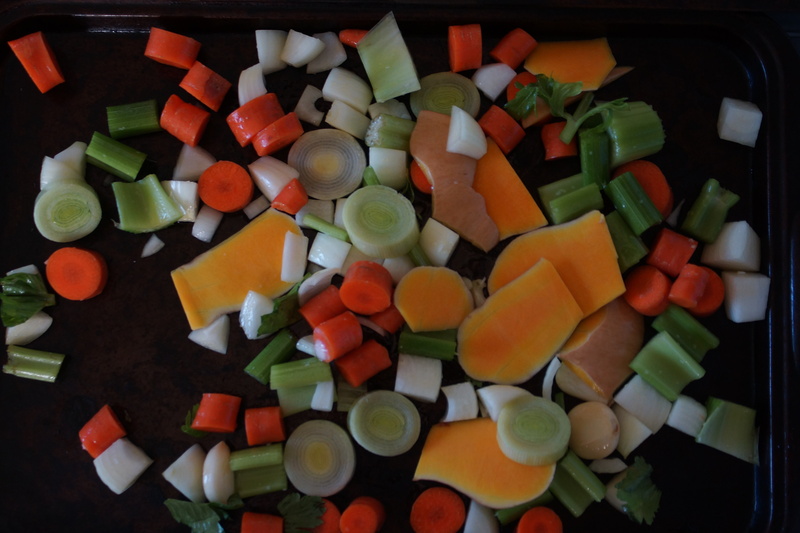 Carrots, celery, onion. Aromatics, a little this, a little that. …to dark, shriveled, caramelized and intense. 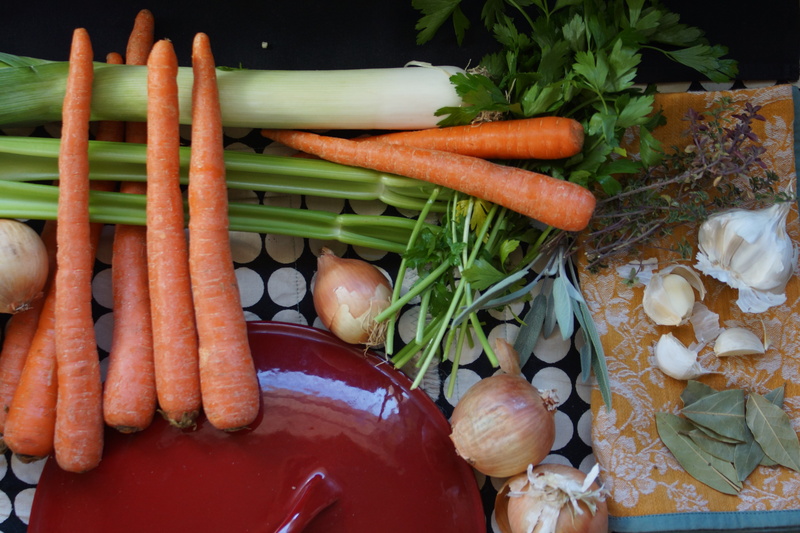 Now we’re ready to make a rich vegetable stock. Put it all together, add some water, boil, simmer. Let it bubble away until the liquid is a delicious shade of brown. 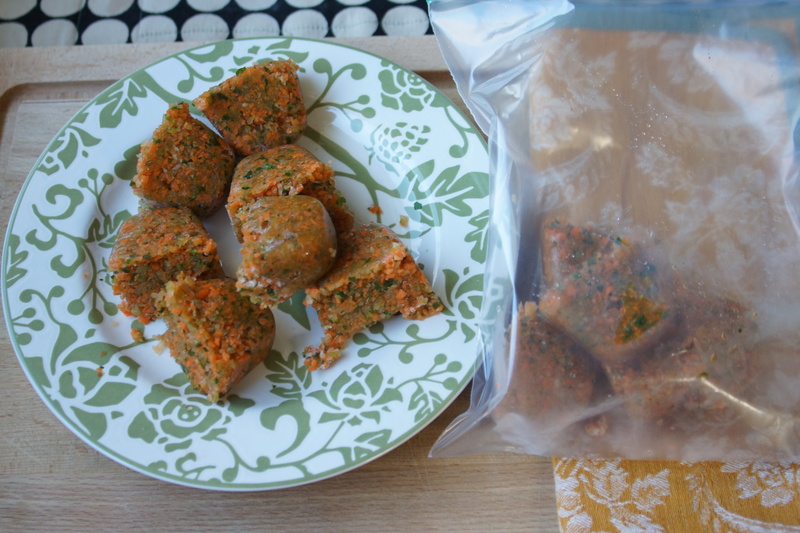 Now you’re ready to strain and divide between freezer-safe containers. Hurray, we just made a whole bunch of upcoming meals better and it barely took any effort. We should do this all the time. We should celebrate with a quick bowl of minestra. Minestra is the quickest, most comforting, homey bowl of soup you could ever want on a chilly day. 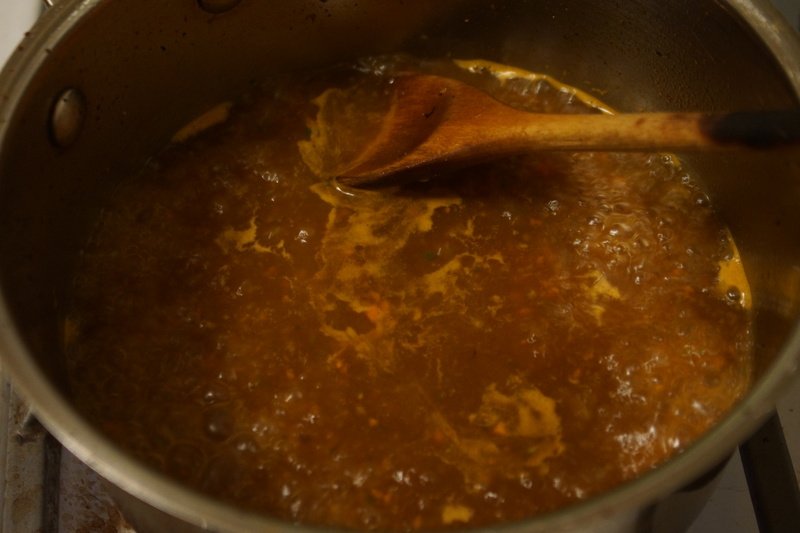 All you have to do is saute a little pestata (a vegetable paste that is used as the soup base), add a little tomato paste, simmer with broth. Easy. 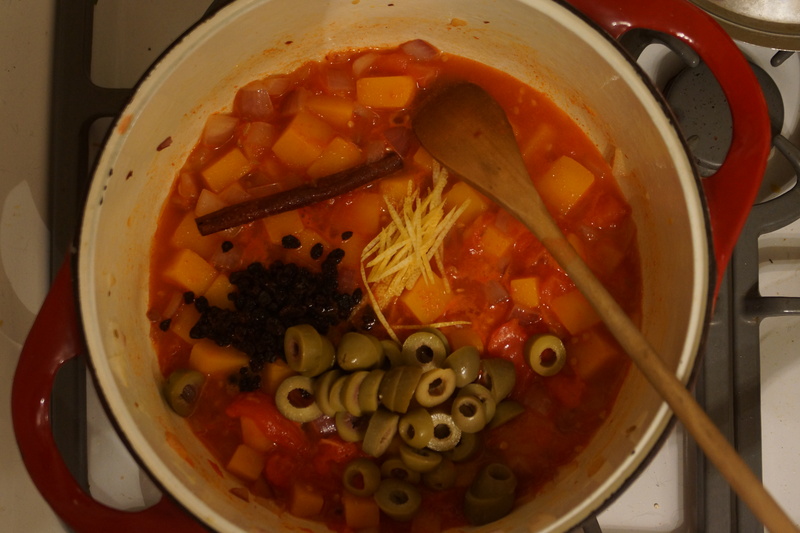 You could add some small pasta or beans and although I’m no linguist, I think your minestra would become a minestrone. 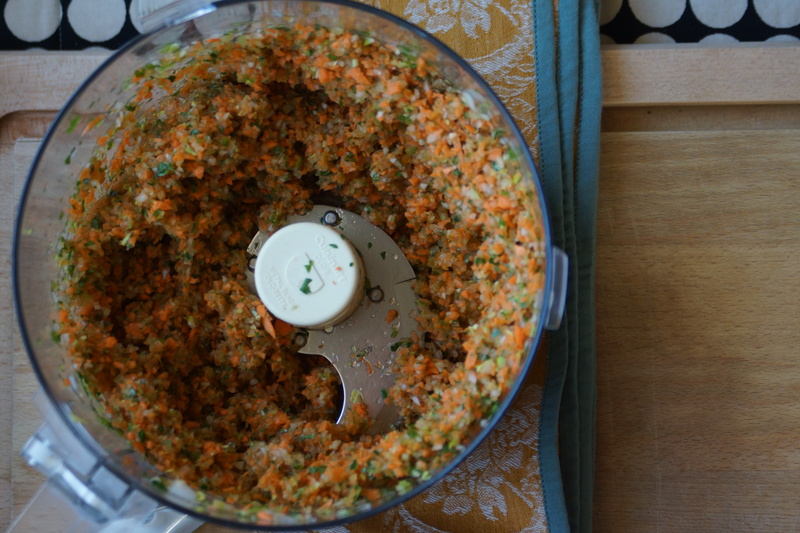 To make the pestata, all you have to do is throw some chopped veggies in a food processor and pulse until you have a thick paste. 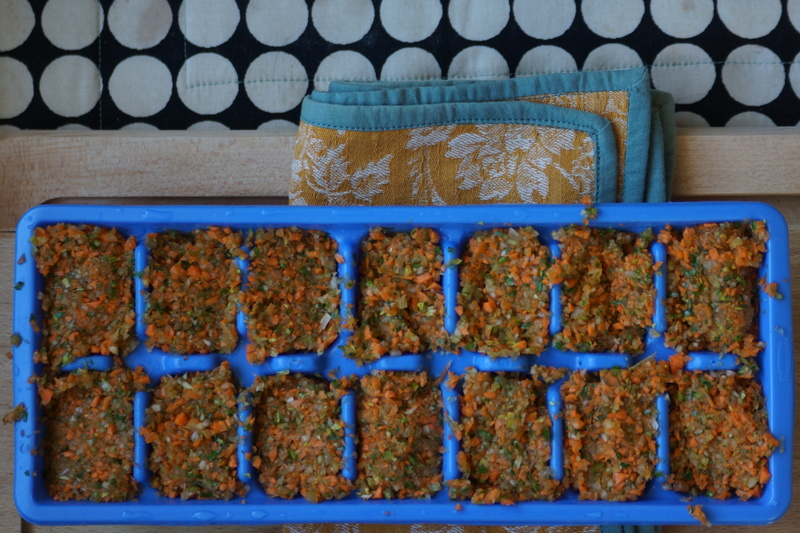 Pack the pestasta into ice cube trays and freeze. 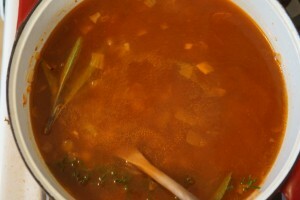 Between your pre-portioned pestata and all your wonderful stock, you can have a quick vegetable soup anytime you like. Add some pasta or beans for a more substantial meal. When you want soup just pop a pestata cube into a saucepan with a little olive oil and saute until it takes on color, add a squirt of tomato paste, and broth. 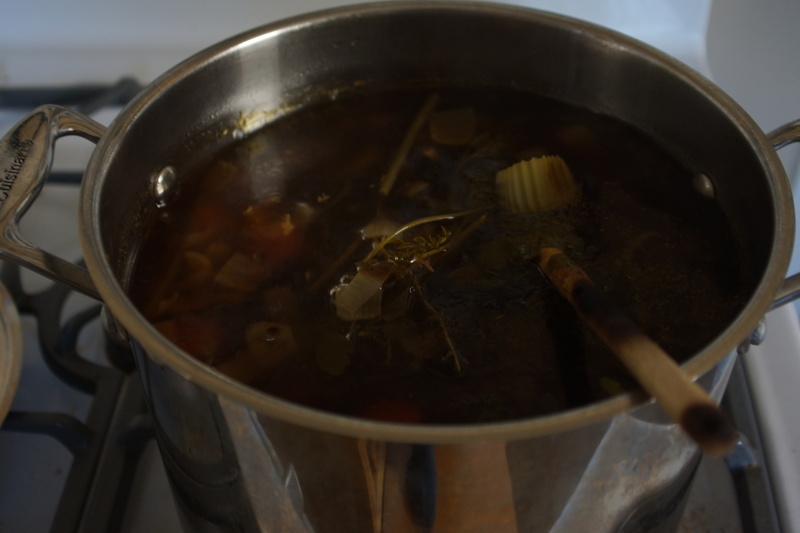 This easy vegetable stock is great for fall and winter soups, stews, and braises. Wash and coarsely chop vegetables. Toss chopped vegetables and garlic with a little olive oil and a light sprinkling of salt and roast on a baking sheet until dark and caramelized, about 45 minutes. 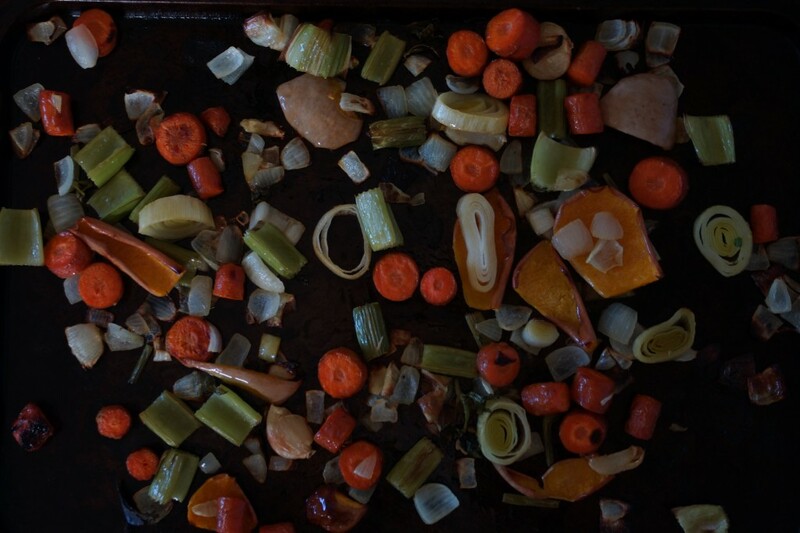 Stir a few times while roasting to prevent vegetables from sticking to pan. 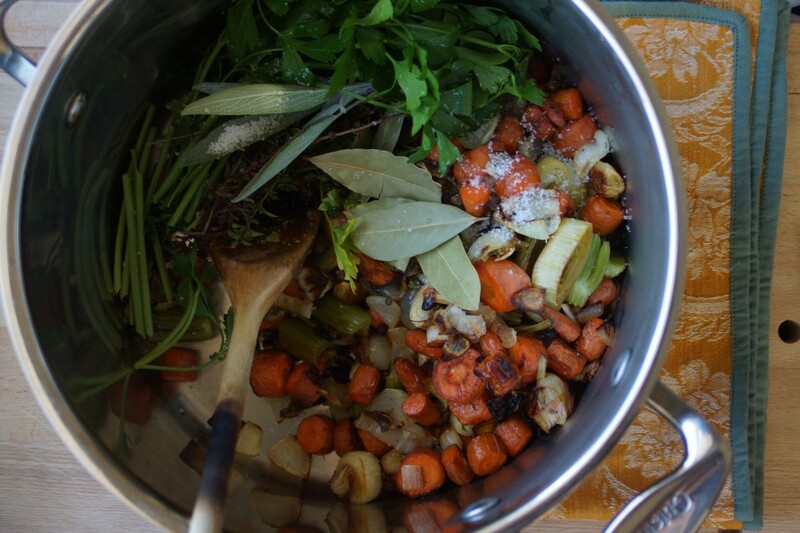 Place roasted vegetables in stock pot, add aromatics, 1 tsp. salt, and cover with cold water. Bring to boil and reduce to simmer. 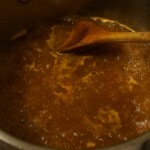 Simmer 45 minutes or until the stock is deep brown and richly flavored. Strain stock. Season lightly with additional salt, if desired. Stock can be used immediately or frozen for future use. This pestata can be portioned into ice cube trays and frozen for a quick bowl of minestra anytime. 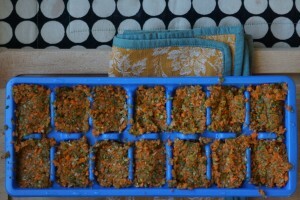 Each cube yields 1 portion of soup. 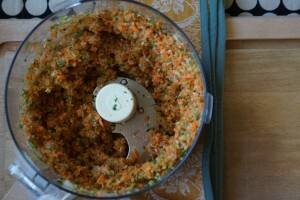 Coarsely chop vegetables and puree in food processor to create a thick paste (pestata). The pestata can be stored in the refrigerator or frozen in small portions. 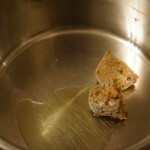 To make the minestra, heat some olive oil in a saucepan, add pestata, season with salt, and saute until golden. You may have to add a bit of water if your pestata is frozen. 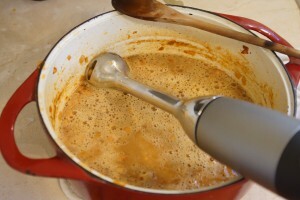 Add a little tomato paste and allow to caramelize briefly before adding broth. Simmer together, season with salt and pepper as needed. Add a small pasta or beans for a more substantial meal and top with grated Parmesan. I’ll admit it. On occasion, after eating what is essentially dessert for breakfast five days straight, I feel a tiny twinge of guilt. But what’s a girl to do? A girl’s gotta eat. And this girl has got to bake! 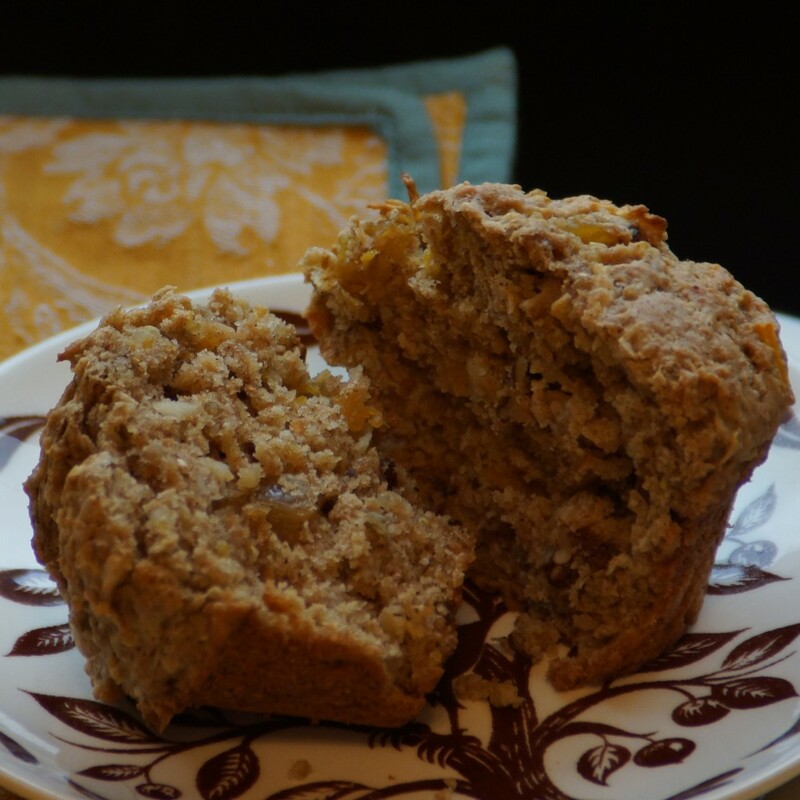 Solution: a healthy, hearty, grainy, good-for-your-body muffin. No delicate, dainty muffin here. This is a muffin that wakes up, steps into steel-toed boots, fastens its toolbelt, and gets to work. And it works hard. It’s going to get you out of bed, out the door, and carry you all the way through ’til lunch. 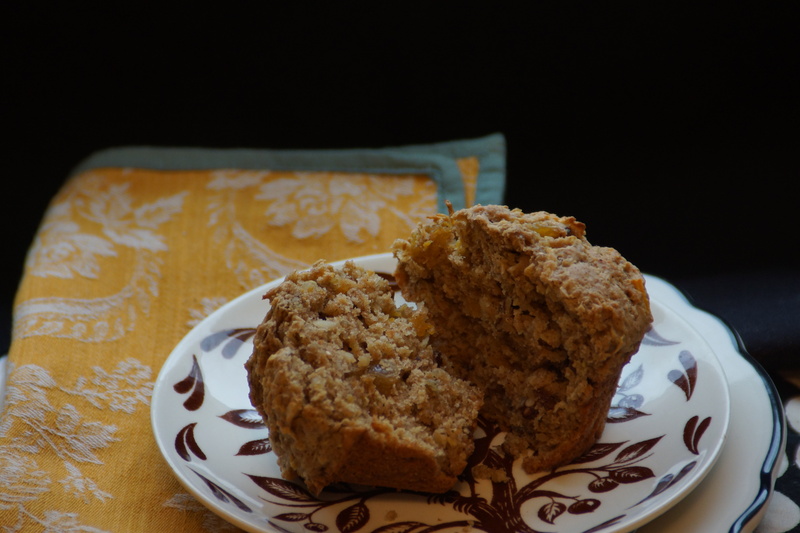 This muffin is not going to flake out on you. 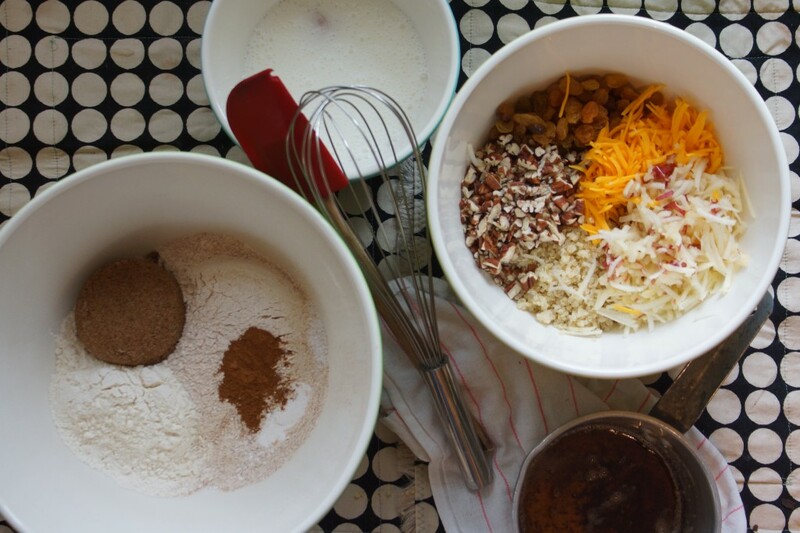 How many other muffins can you count on to do the same? Building blocks: quinoa (it’s a super-food, you know), squash, apples, raisins, nuts. That’s grated butternut squash, not cheddar cheese. 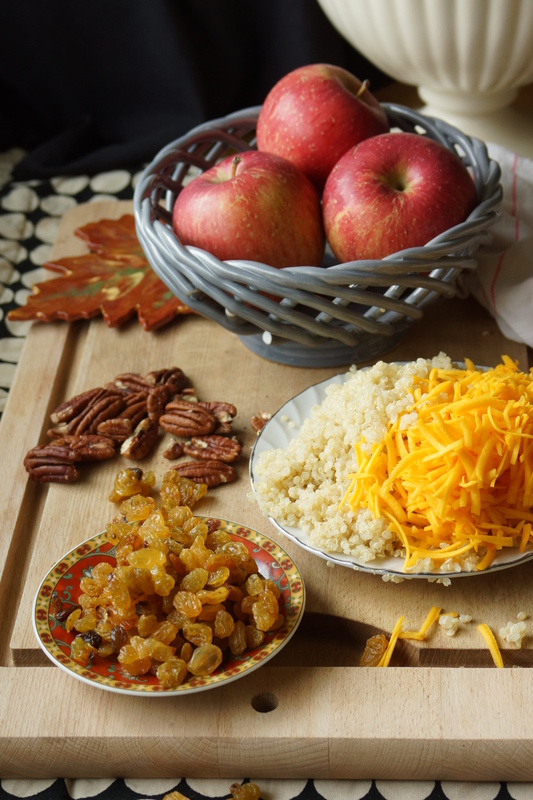 Hmm…cheddar might not be a bad idea…next time. 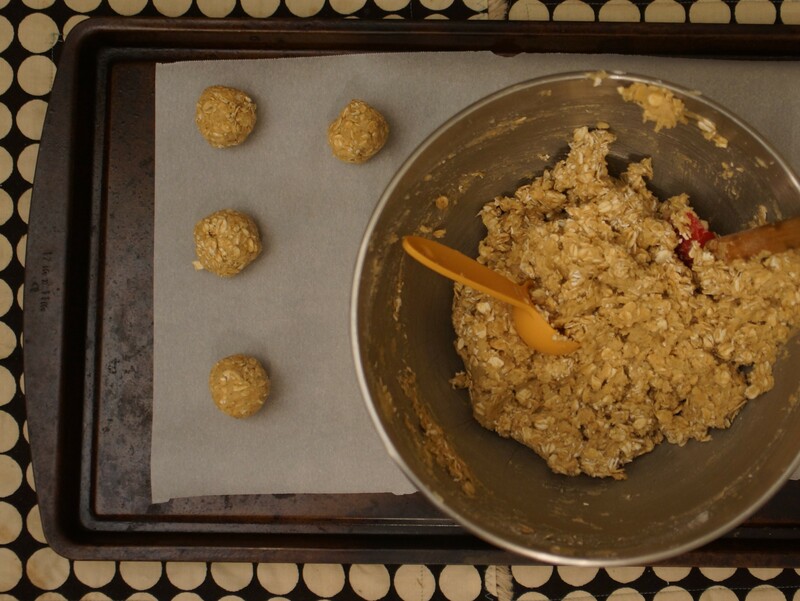 Combine dry ingredients, brown a bit of butter, whisk egg with buttermilk, toss the quinoa and other tasty touches together in a bowl. Bring it all together. 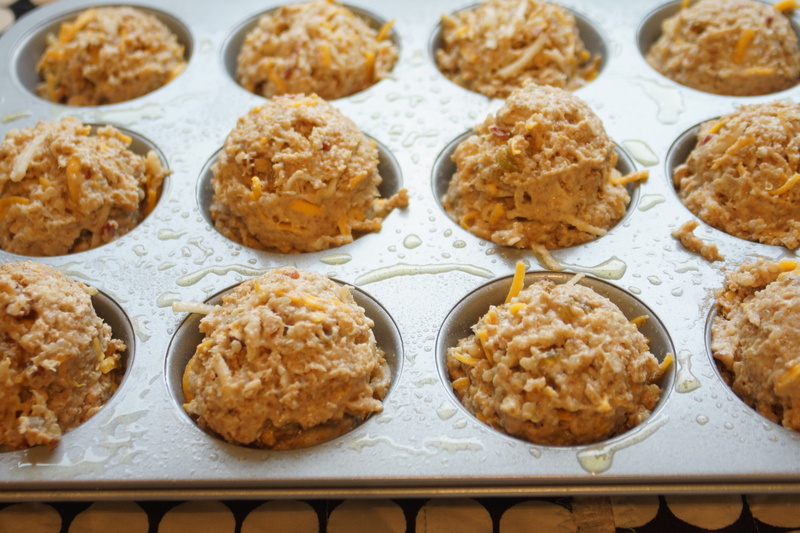 Into a muffin tin and into your oven. 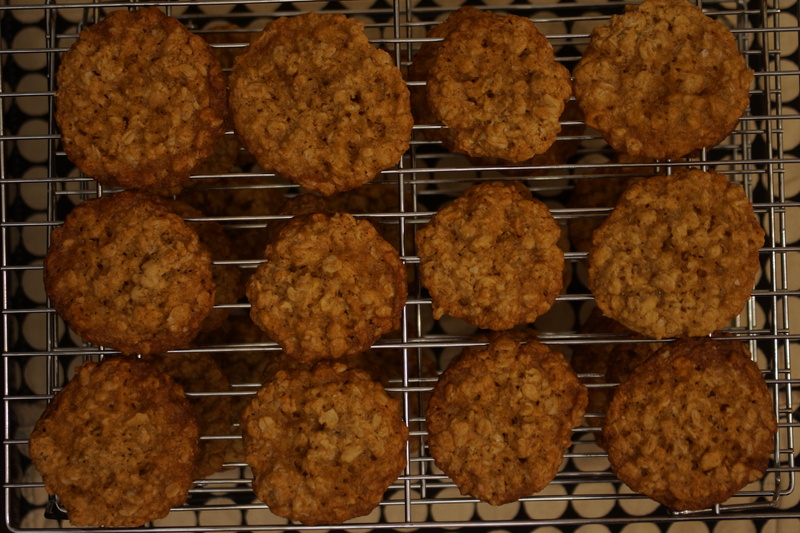 Golden & toasty, a little crunchy, a lot healthy, super satisfying. I call middle-right, you can have top-left. 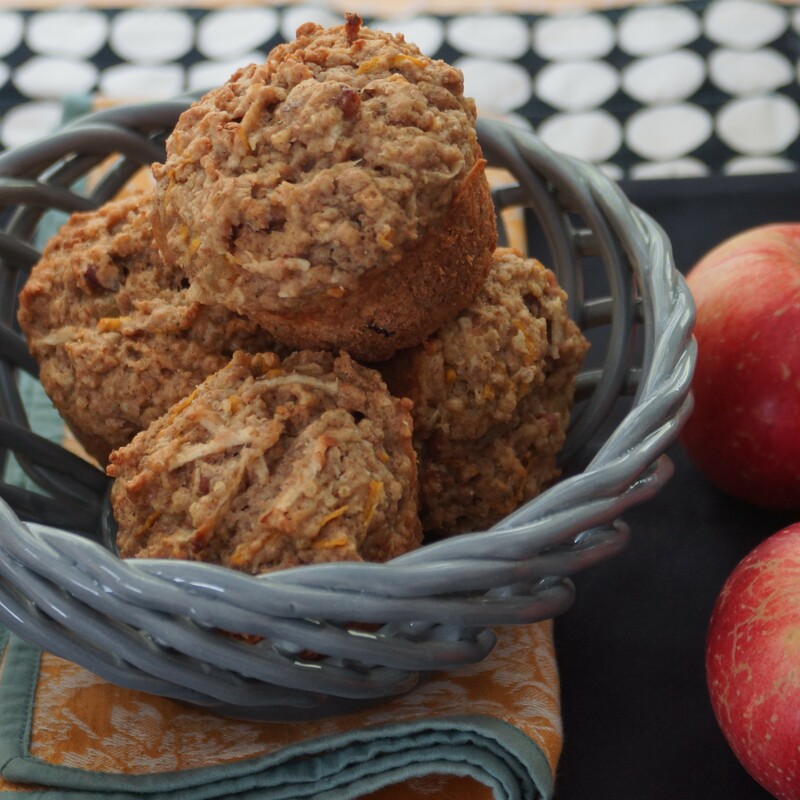 You are going to love these wholesome, nutty muffins. 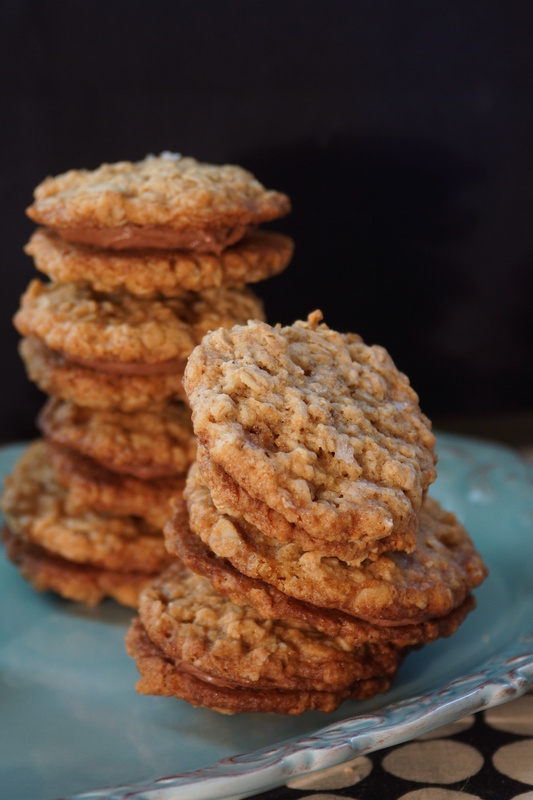 They’re so good you might not even want to go back to your more decadent breakfasts next week. 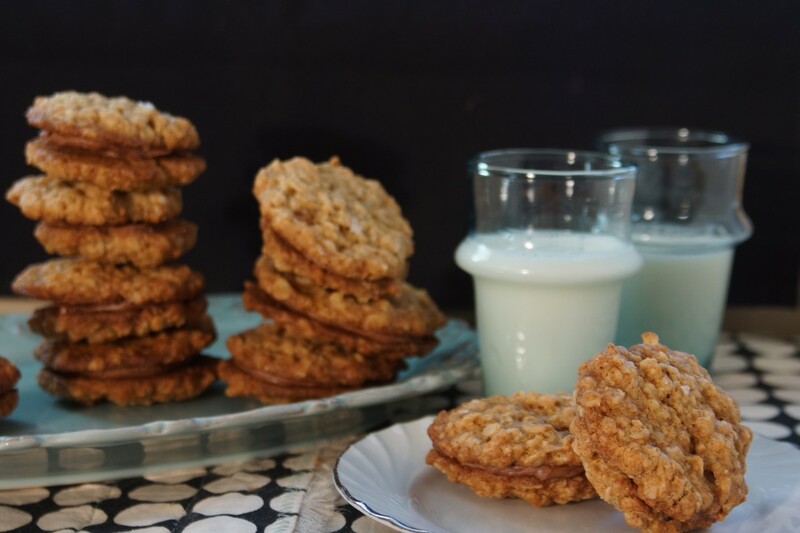 You may even make another batch, try another variation, other whole grains, different secret vegetal add-ins. 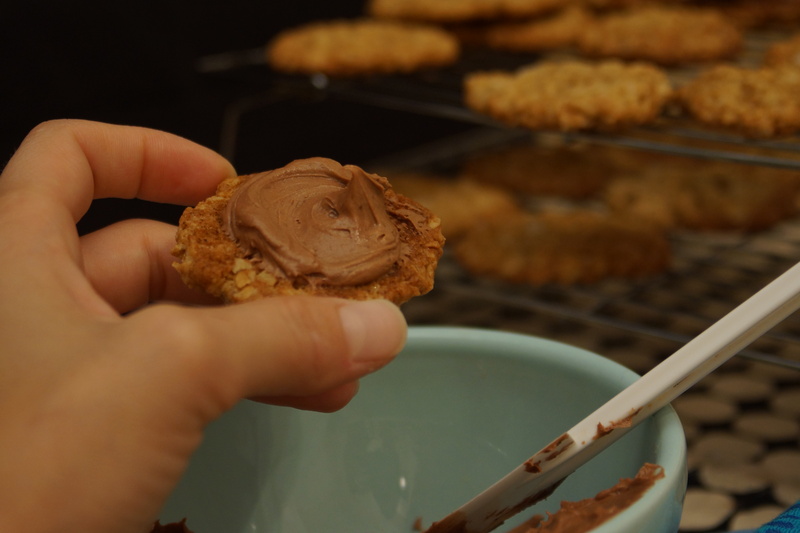 Or maybe you’ll rediscover the jar of nutella. 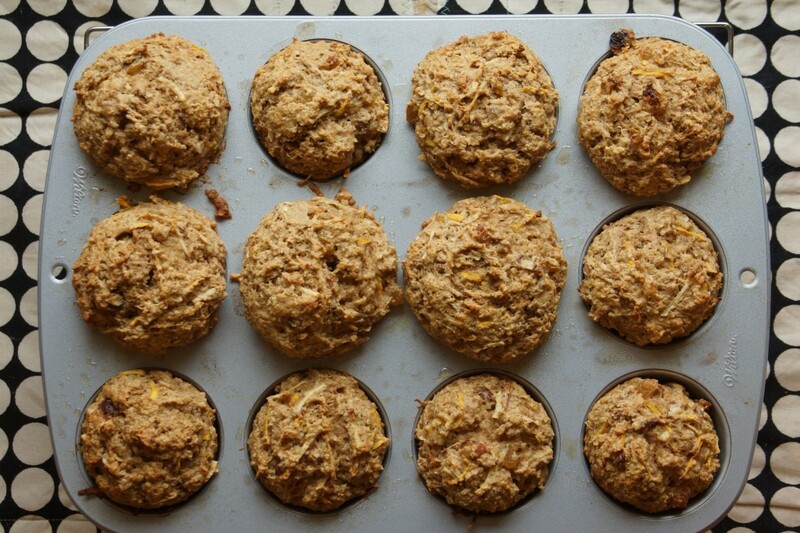 These muffins are wholesome, flavorful, and moist with just enough crunch. 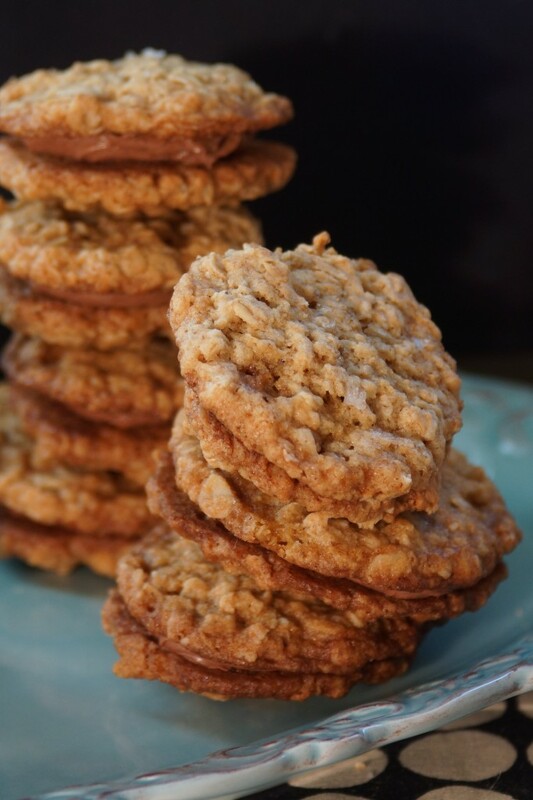 Customize them with your nuts and favorite dried fruits. Preheat oven to 375°. Butter or spray a 12 cup muffin tin. 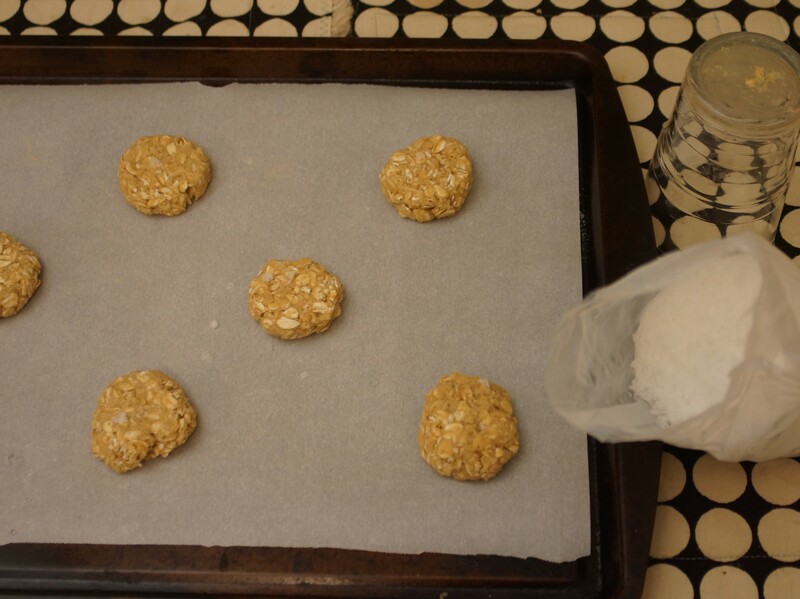 Combine flours, baking soda, baking powder, salt, brown sugar, and cinnamon in large bowl. Mix well. 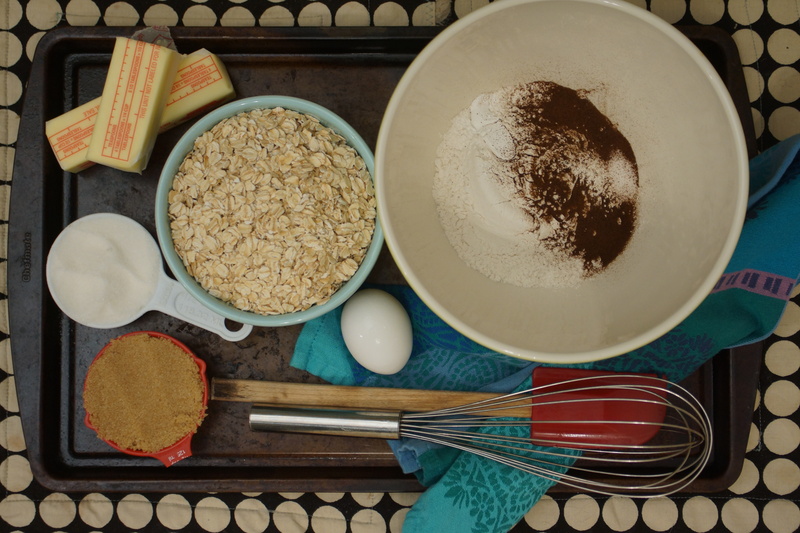 In medium bowl, whisk together egg, buttermilk, browned butter, and vanilla. 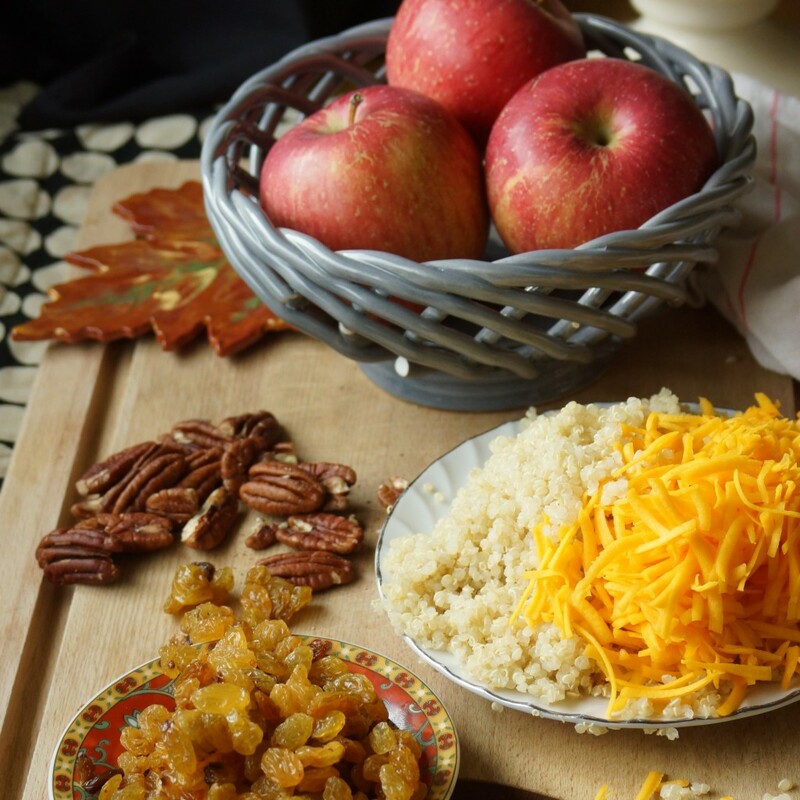 In another medium bowl, combine quinoa, apple, squash, raisins, and pecans. Fold quinoa mixture into muffin batter and scoop into prepared muffin cups. 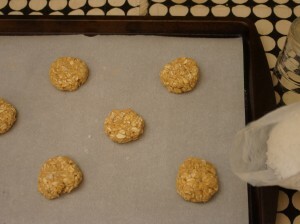 Bake until golden and tester comes out clean, about 30 minutes.